I can't wait to see who wins the Dals, it's going to be so much fun !! If I knew Vendettina was going to be a prize, I wouldn't have signed on to judge the contest I would have been competing :p .
I honestly didn't know what I would be getting ahead of time, I asked for a mini dal which they said they donate so I e ected a mini dal. I'm extremely thankful that Pullipstyle was so generous especially when they really didn't have to be and that we ended up with such wonderful prizes. To anyone who didn't sign up this time and is regretting it there will be other rounds. Thinking of this as raising the stakes for the people who did enter, I want to see everyone's best effort . If I could have managed to order Sailor Moon sooner I would have as it is I still owe Mr. Klein the $10 he loaned me so I could order her last week ^^; I'm sorry to anyone with hard feelings on this. What a fabulous boost to the prizes! I am also very appreciative to those who donated prizes and those who volunteered to judge. (09-26-2014, 05:01 AM)Hina Ichigo Wrote: If I knew Vendettina was going to be a prize, I wouldn't have signed on to judge the contest I would have been competing :p .
I have to agree with this, I'd have done the same had I known. But then again, I think the point the contest is to 1) have fun, and 2) lavish your Dal with attention and some time in the spotlight by making her the star of some photos. The prizes (spectacular as they are) are like icing on the cake. Thanks to all the sponsors who donated the awesome prizes, and to Kanamai for organizing the contest, and for the contestants who signed up to participate. I'm looking forward to seeing the entries. Also, thanks to the organizers as well. I don't mean to leave them out. I've never done one of these, so it was a fun thing to enter, prizes or no. I think all the sponsors and judges should be given our full gratitude. How generous of Mike to donate such a special doll I just wish I could take a decent photo to save my life then I would have entered ! What a wonderful surprise! Usually Pullip family photo contests don't have much to offer for prizes beyond bragging rights. 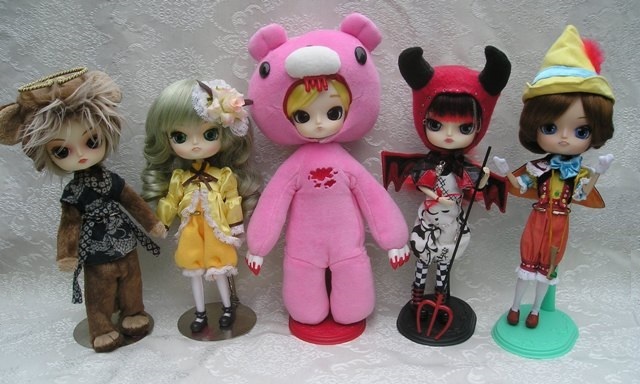 I'm really amazed that there are any kind of prizes at all, let alone full size dolls. Wauw Vendetta!! Djeez I am going to do my utter best!! Good luck to all the contestants! And a big thumbs up for the organizers and donators!! Gloomy and Pity have tempted me. Are the rules similar? I've only got the 1 Dal at this point. (10-02-2014, 07:04 AM)Kyubi09 Wrote: Gloomy and Pity have tempted me. Are the rules similar? I've only got the 1 Dal at this point. Nope, it's not a photo contest. People will earn contest entries by posting at the forum and starting new threads, then one winner will be chosen at the end. That's it! It's actually a fun group. Been checking out the Holiday Swap photos, and thinking maybe it would be fun to sign up.